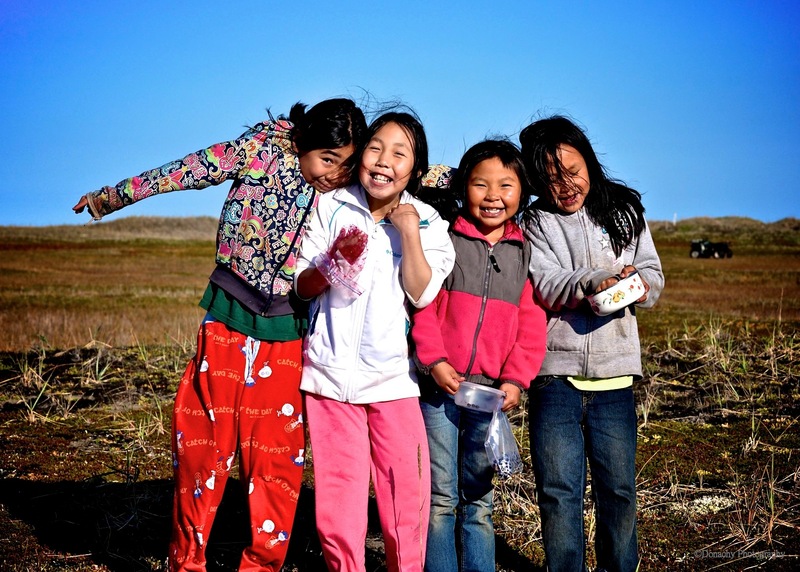 Friends from Shishmaref after an afternoon of blueberry picking. 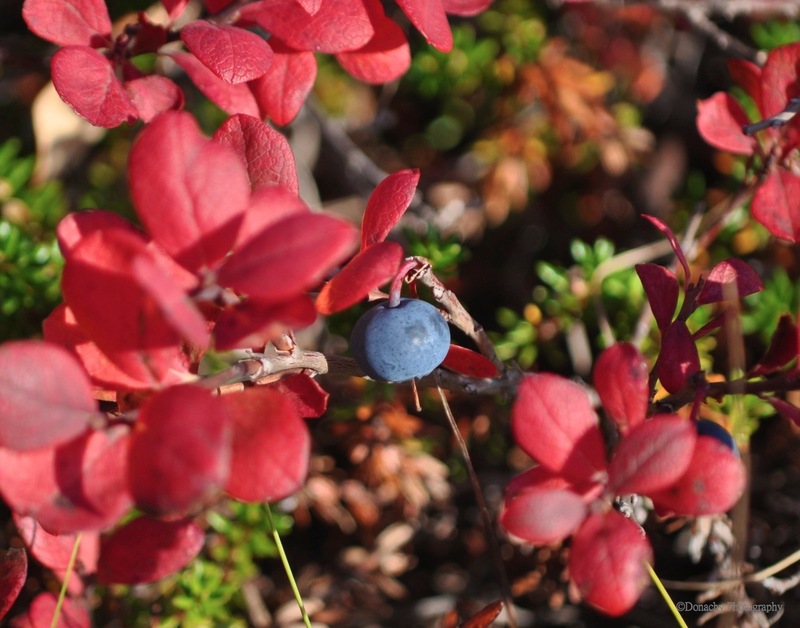 Gathering a cupful or two of these small, tart berries growing in scattered clumps across the tundra was work… the fun kind. The following morning, we celebrated with a stack of blueberry waffles. “Follow” is the village English way of saying “come along.” And sure enough, once we learned to key in on the unmistakable Autumn-red of the bushes (if ground-hugging plants that top out at six-inches can properly be called bushes), we began finding an abundance of small, perfectly ripe, deliciously tart berries. The comparatively thick, woody stems of some of these bushes suggested that they had weathered quite a few seasons near the Arctic Circle. Growing among the blueberries were crowberries (locally called blackberries) and low bush cranberries. Elsewhere in the far north, including in Europe, there are cloudberries, perhaps the most delicious berry on earth. We walked along in the late summer sun, finding patches of berries here and there, crouching and kneeling to pick, and then moving on to find another patch of tell-tale red. Birds were out sharing the bounty – or maybe the insects associated wtih the fruit: lapland longspurs, white-crowned sparrows, savanah sparrows, and other small birds. The pause that refreshes. 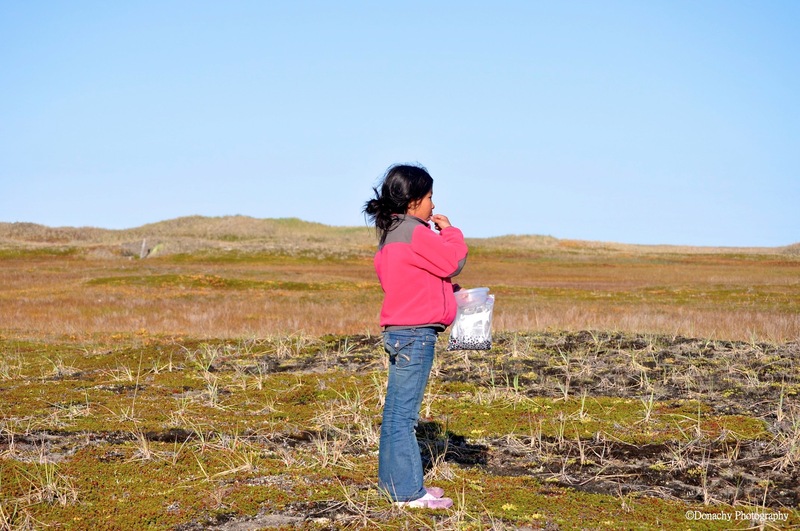 A berry-picker gazes across the open tundra on Sarichef Island where Shishmaref is located, snacking on a bag of berries that probably aren’t going to make it all the way home. The red leaves near her feet? Yep. Blueberries! 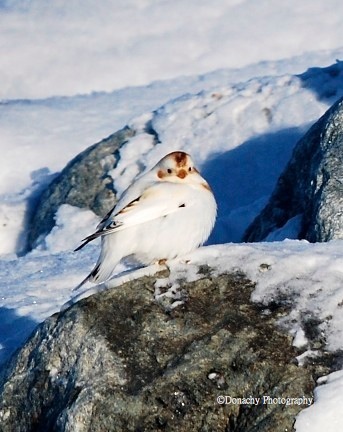 Feathers puffed against the cold, a female McKay’s bunting warms herself in the radiant heat from a rock. Daily highs are reaching the teens and even the twenties now, and today’s sunshine stretched from sunrise at 7:00 AM to sunset at 11:13 PM. The midnight sun is back, and so are the birds! Gripped in the heart of winter, an Arctic landscape can be one of the quietest places on earth. Save for a few hardy ravens that manage to make a living off dumpsters and the local garbage facility, most birds head for warmer climes. There are no tree branches for the wind to whistle through, no dry grass to rustle, and on the coldest nights, even the village dogs huddle up and stay mum. Dark settles in, and the waiting begins. 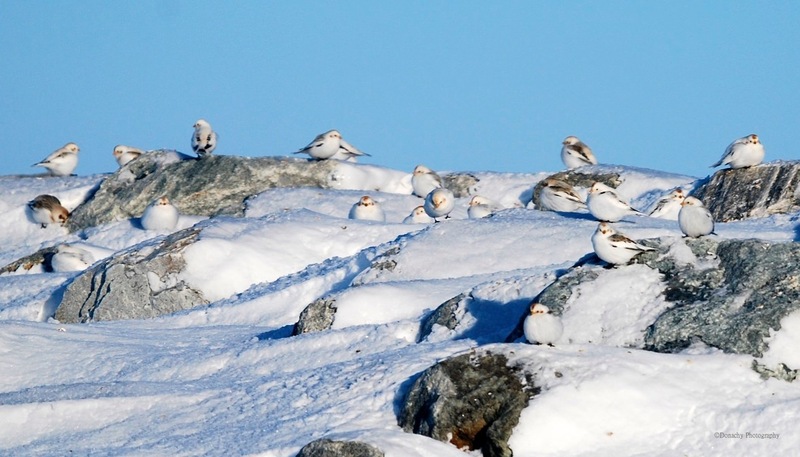 For the past couple of weeks, we’ve increasingly been hearing the welcome twitters and chirps of flocks of the snow birds of the north, snow buntings and McKay’s buntings. It’s been weeks since the last windstorm, and these days we can feel the warmth of the sun on our faces. It feels… wonderful. I’ve always admired passerines – songbirds. 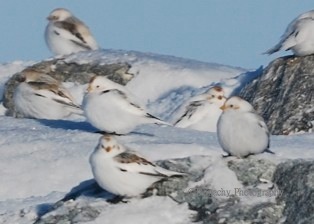 These snow buntings have become some of my favorites. As the snow melts, interesting things are being uncovered. I think it was Agatha Christie who stumped me with a story of a body which had been found lying by a puddle of water with no murder weapon to be found. Though I puzzled over this, I couldn’t figure it out. Today as we walked around our village, we heard a loud crash, almost like thick glass shattering. 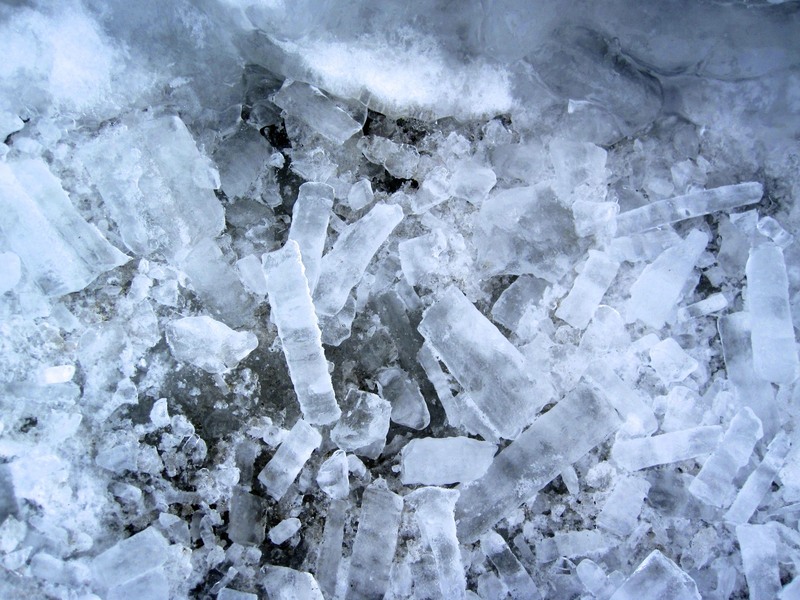 We turned to see fragments of a large icicle smashed on the ground next to the school. Looking up, we saw clear, sharply pointed, pendant masses hanging menacingly. These icicles were substantial–their girth the size of pop cans. Hung next to each other, they resembled monstrous fangs ready to devastate. The skin was laid out, its mylar-like hair glistening in the sun by his home. 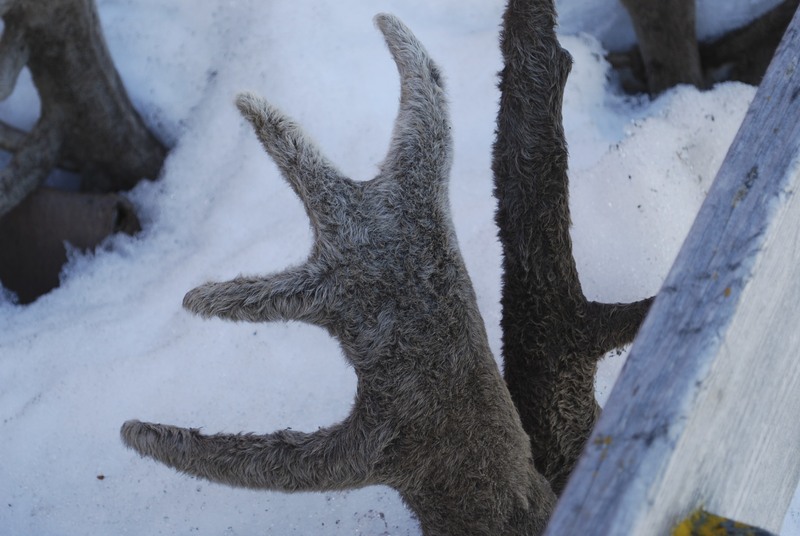 It was easy to see why polar bear hair was once a highly valued material for fly-tying. But for how silky the fur looked, it felt surprisingly coarse to touch. The paws, of course, were huge, and the foot pads were thick and tough and leathery. 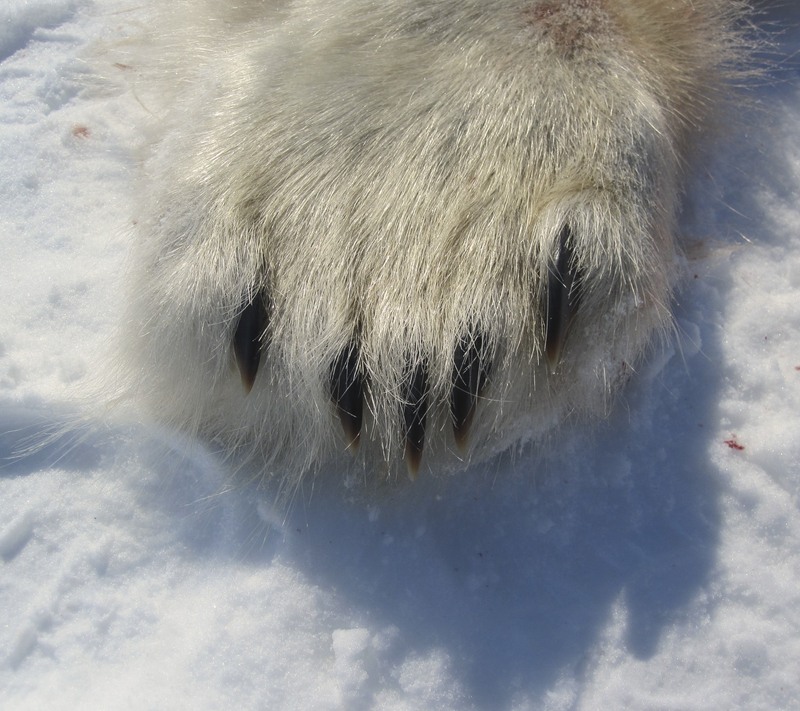 Stroking the fur and foot pads with our bare hands, we felt a connection to the vast miles of ice this bear had traveled, the arctic cold and wildness, the remoteness of this place. 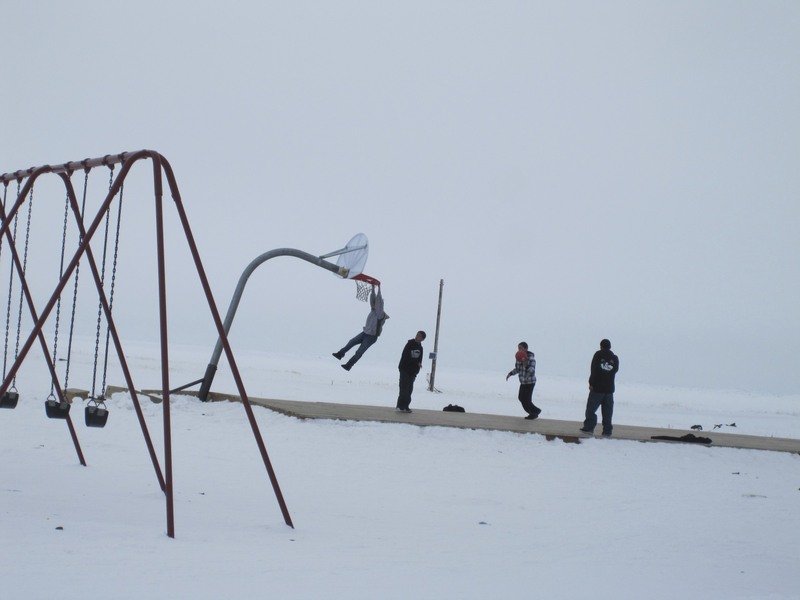 It’s time to “play out.” As in the lower 48, the kids are sensing the end of school is near. State testing is done. 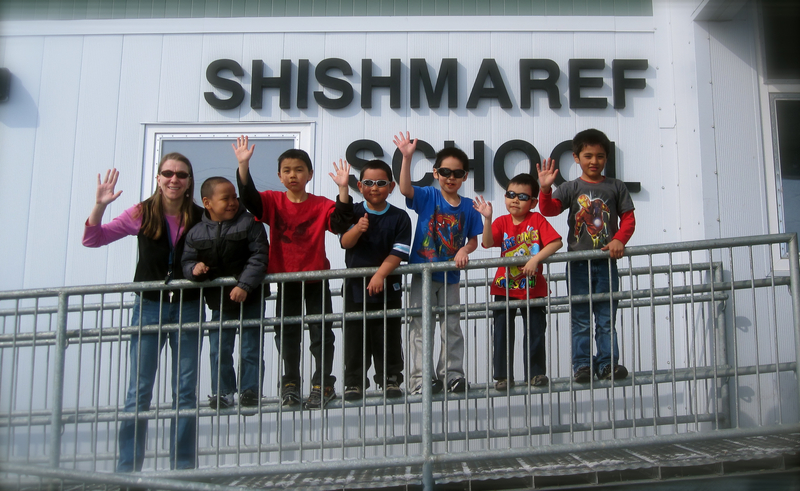 Our school carnival and Inupiaq Days are done. Summer is just around the corner.